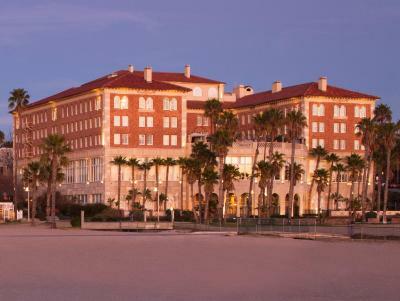 Lock in a great price for Casa Del Mar – rated 9 by recent guests! The staff was 1000% amazing, the extra birthday touches, virgin mojitos for my daughter, wonderful decor, great location.... cannot wait to return! I rarely leave reviews but I was beyond impressed with this hotel! Security met me on 5th floor and asked if I belonged in the hotel 20 min after checking in. A Latin/Hispanic origin man on security team treated me like a criminal trespasser. Everyone was beyond friendly, helpful and welcoming. 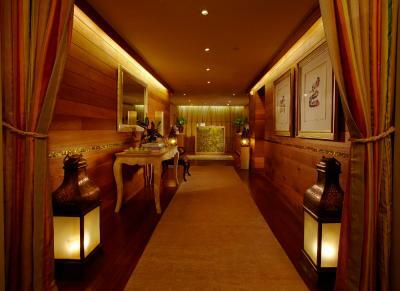 The hotel is beautiful, luxurious and comfortable. And the shower was a dream—I love strong water pressure. The staff couldn't have been more helpful. They constantly surprise you with extra perks. For example, when the manager saw me reading a book of poetry after my massage, she insisted that I take it home with me. They graciously offered a wonderful room upgrade without being asked, and the little extra chocolates, refreshments, room embellishments seemed endless. It's pricey but so worth it. Staff was friendly. Food was very good. Accommodations were clean and comfortable. 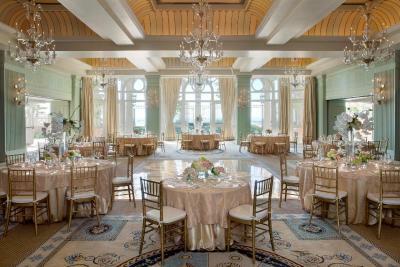 Everything, beautiful property, amazing location, service was impeccable! We loved the room- very comfortable. Service was great. Location is fantastic. Also appreciated the welcome drink and free bike rental! We had a lovely time. I had booked a one bedroom suite with no view, but upon arrival, we were given a full-frontal ocean view at no extra charge. 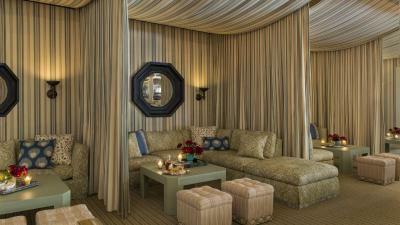 The suite was spacious with dramatic views of the ocean, and the pool area. When making the reservation, I had only mentioned that we were celebrating my daughter's birthday. We were greeted with chocolate-covered strawberries and a most impressive fruit basket, in addition to a fabulous turndown service while we were eating dinner. Great valet parking service. We had dinner at Catch. Food was delicious; a free happy birthday dessert beautifully decorated. Check out was at 12, so we had plenty of time to spend the morning at the beach, and in the pool area. I don't think anyone could ask for a better experience! I can't wait to go back. Casa Del Mar This rating is a reflection of how the property compares to the industry standard when it comes to price, facilities and services available. It's based on a self-evaluation by the property. Use this rating to help choose your stay! One of our best sellers in Los Angeles! 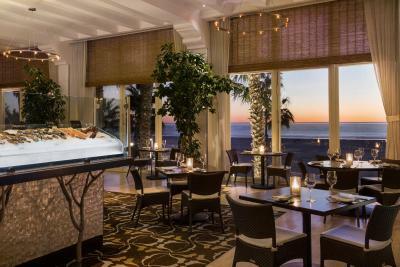 This Santa Monica oceanfront hotel features 2 on-site restaurants and has a hydrotherapy spa tub in each room. It offers an outdoor pool and hot tub. 3rd Street Promenade is 5 minutes’ walk away. 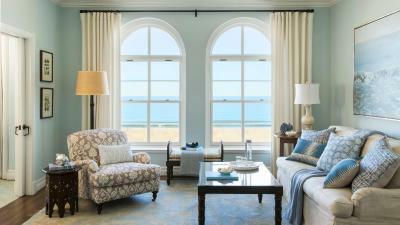 Some rooms include views of the ocean. 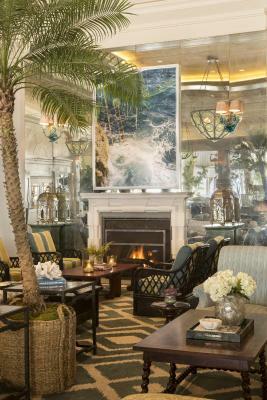 A 42-inch flat-screen cable satellite TV is featured in each air-conditioned room at Casa Del Mar. 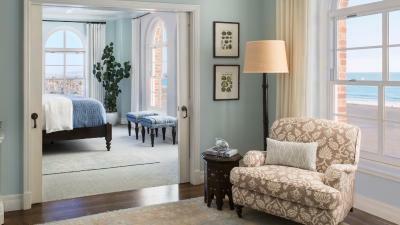 Each elegant room is decorated in soft colors and features floor-to-ceiling glass windows. All of the pet-friendly rooms include a coffee maker, a mini-bar and ironing facilities. 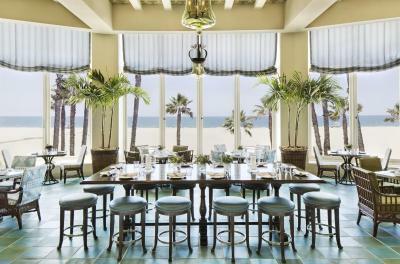 Offering a menu of fresh seafood and a daily raw bar, Catch is located at Casa Del Mar. 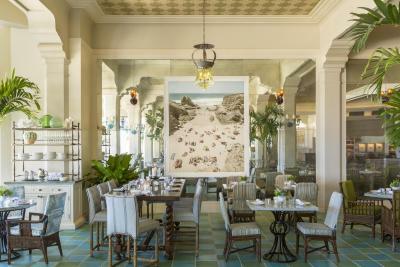 The restaurant is open for breakfast, lunch and dinner and features a weekend brunch with live music every Sunday afternoon. 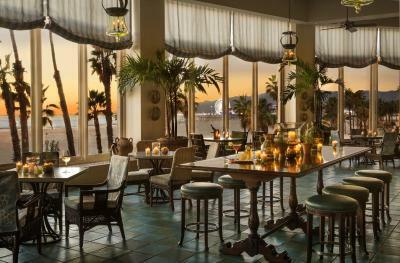 Small plates and nightly music are offered at The Terrazza, located in the hotel lobby. 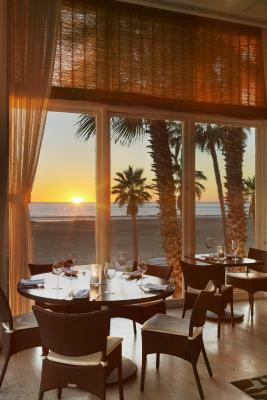 The restaurant provides guests with 180 degree views of the Pacific ocean and offers breakfast, lunch, and cocktails at night. 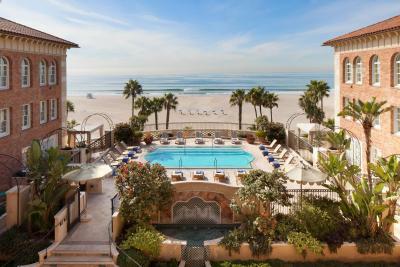 Guests of Santa Monica Casa Del Mar can work out in the fitness room and private trainers are available. A business center with fax and photocopying services and a gift shop are located on site. 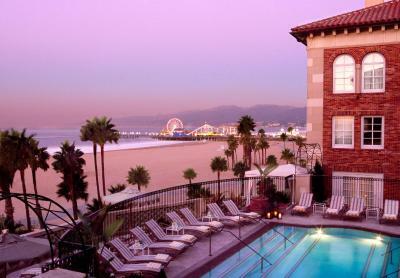 Venice Beach is 15 minutes’ drive away from this hotel. Los Angeles International Airport is 9 miles away. Featuring a hydrotherapy spa tub, this air-conditioned room has a 42-inch flat-screen satellite TV, a DVD player, a CD player, a coffee machine, a minibar and ironing facilities. 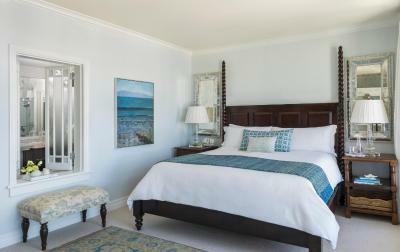 This room offers beautiful views of the Pacific coastline, either looking south towards Catalina, or north towards Malibu. 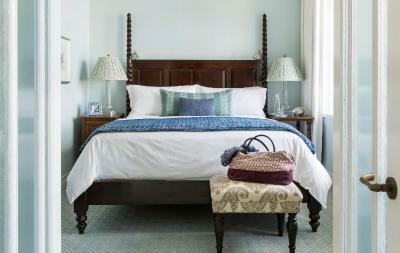 Decorated in calming blue sea tones, it includes a rich walnut 4-poster bed dressed in crisp white linens and a 42-inch plasma TV. The Italian marble bathroom features a flat-screen TV and hydrothermal massage tub. Featuring a hydrotherapy spa tub, this air-conditioned room includes a 42-inch flat-screen satellite TV, a DVD player, a CD player, a coffee machine, a minibar and ironing facilities. It provides partial ocean views. 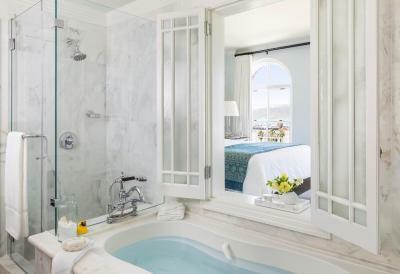 Featuring a direct facing view of the Pacific Ocean, this room offers an private bathroom with Italian marble tile and hydrothermal massage bathtub. A 42-inch flat-screen satellite TV with DVD and CD player, a coffee machine, a mini-bar and ironing facilities are also provided for convenience. 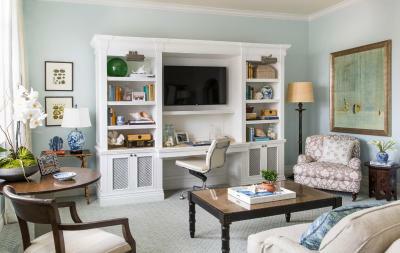 This suite features a 42-inch plasma TV and Italian marble bathrooms. 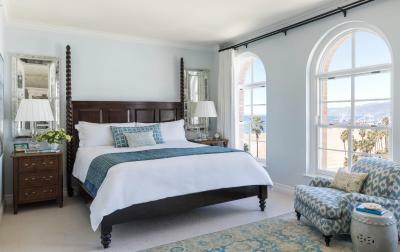 Calming blue sea tones decorate the room along with a rich walnut four poster bed dressed in crisp white linens. 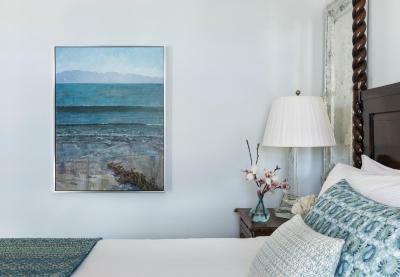 Featuring panoramic views of the coastline and Santa Monica beach, this suite is decorated with calming blue sea tones and a rich walnut four poster bed. 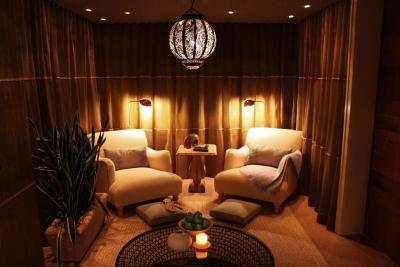 A 42-inch plasma TV is also featured as well as a flat-screen TV in the marble bathroom and hydrothermal massage tub. 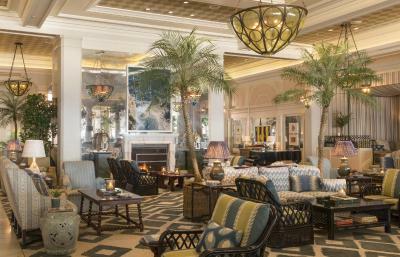 Casa Del Mar accepts these cards and reserves the right to temporarily hold an amount prior to arrival. Please note: Any cancelations past 16:00 PST on the day before arrival is considered past the 72-hour cancelation period and is subject to additional charges (see Hotel Policies). 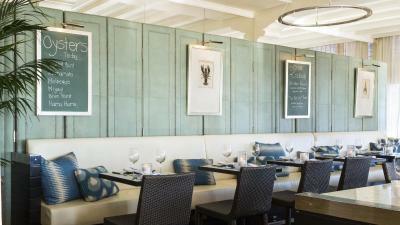 Please note that bed & breakfast packages offer a USD 60 per day breakfast credit. Coffee in the lobby restaurant was overpriced and ordinary. Room decor, location, town car use, lobby. I had a short stay and the weather didn't cooperate.